Note that all of the images in an ImageList must be the same size. Download the 48x48 flag images for Australia, Austria, Belgium and Botswana by following the links from printableworldflags.com. Start a new application, select menu item File > Save All, then save the project as ImageListDemo and the unit as uImageListDemo. Drop a TImageList from the Common Controls component tab onto the form. Using the Object Inspector, change the values of the Height and Width properties of ImageList1 from 16 to 48 and the ShareImages property from False to True. Click the Add ... button of the ImageList Editor, navigate to where you saved the map icons, and open Argentina.png. Repeat the last step for Austria.png, Belgium.png, then Botswana.png and click the OK button. Drop onto the form a TComboBoxEx from the Misc tab and select in the Object Inspector its Images property. Select ImageList1 from the drop-down list. Change the ItemHeight property to 48 and the Width property to 180. Click on the Font ellipsis (...) and change the font to Arial and its size to 16. Click the ellipsis for the ItemsEx property. Click the Add button four times. Change the Caption property of the first TComboExItem (Item 0) to Australia and its ImageIndex to 0. Change the Caption property of the second TComboExItem (Item 1) to Austria and its ImageIndex to 1. Change the Caption property of the third TComboExItem (Item 2) to Belgium and its ImageIndex to 2. Change the Caption property of the fourth TComboExItem (Item 3) to Botswana and its ImageIndex to 3. Change the ItemIndex of the ComboBoxEx to 0. You should see the flag of Australia in the design view of the form. 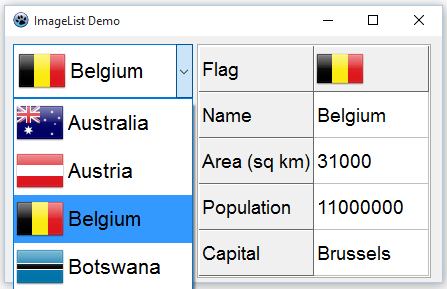 If you execute the program now and click on the ComboBoxEx you should see a drop-down list of the four countries with their flags and be able to select any of them. Drop onto the form a TStringGrid from the Additional components tab. Set the ColCount property to 2, the DefaultColWidth to 115 and the DefaultRowHeight to 48. Click on the Font ellipsis and change the font to Arial and its size to 14. Click in the edit box for the TitleImageList property and select ImageList1 from the drop-down list. Click on the columns ellipsis and click the Add button. Expand the Title property of the TGridColumn that you have added and change the Caption property to a single space. Change the ImageIndex property to 0 and the ImageLayout to blGlyphLeft. You should see the flag of Australia at the top of the second column. Paste this code to replace the default code in the unit. Using the Object Inspector, select FormCreate for the OnCreate event of the form and ComboBoxEx1Change for the OnChange event of ComboBoxEx1. See the following pages for Pascal code to populate the ImageList and ComboBoxEx and for putting an image into any cell of a StringGrid.